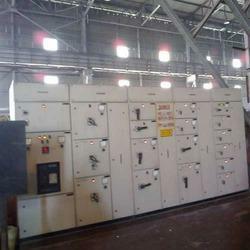 Gas Insulated Switchgear are gaining popularity in India and many other countries. It consumes much smaller space comparing to outdoor switch yard. Space restraints forcing project owners to opt for Gas insulated switchgears instead of Air insulated. All switchgear components like CB, isolator, CT, PT, LA bus bars are mounted in SF6 gas filled chambers. Since SF6 gas provides much better insulation than air. the phase to phase and phase to earth clearances can be reduced considerably resulting in very compact design of switchgear. Electrical power distribution system for material handling plants comprises of HV/LV MCCs. 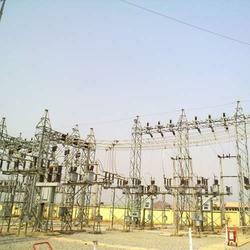 Overhead transmission lines upto 132kV are used in many industries or by Utility companies for distributing power from grid substations or distribution substations upto industrial/commercial/domestic load centers. These lines are made of ACSR conductors drawn over lattice steel/rail/steel tubular/PCC poles. 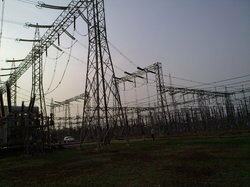 The design of these lines are done with the help of CBIP transmission line manual. 400kv switch yards are generally connected in one and half breaker scheme or two main and one transfer bus scheme. 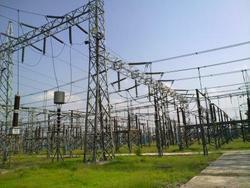 400kv voltage level is mainly used at national grid level or at power evacuation switch yard of large power plants. Entire control and protection of individual bay equipment is carried out from field kiosk mounted bay control units. These bay control units stay connected with substation automation system (sas/scada) in control room for remote control. 132kv switch yards are generally connected either in one main and one transfer or in double bus scheme. 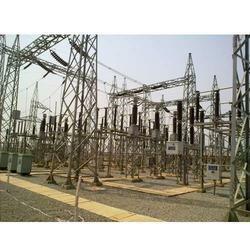 132kv voltage level is either used at grid substation level or at main power receiving point of large industries. Entire control and protection of individual bay equipment is carried out directly from control panels mounted in control building. These control panels are connected with substation automation system. 33kV switch yards are generally connected either in one main and one transfer or in single bus scheme. 33KV voltage level is either used at grid substation level or at main power receiving point of medium sized industrial Plants. Entire control and protection of individual bay equipment is carried out in the Control room. 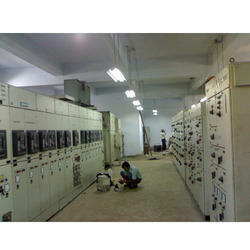 Indoor substations are generally used for power distribution at medium voltage levels of 33/11/6.6kV. 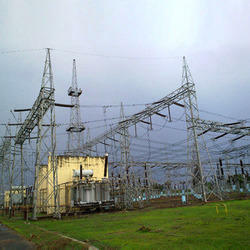 Transformers are located outside and all switchgear are mounted inside substation building. The cabling between various equipment is done either in cable trenches or in cable spreader rooms. 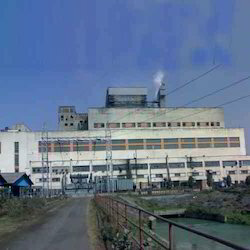 Electrical balance of plant of power plants includes complete power distribution system for the entire power plant except the turbine-generator package. It includes the EHV switch yard and all switchgear transformers, cables, cabling materials, lighting of all substations and various plant buildings. EBOP includes Coal handling system, Ash handling system, Water Intake, treatment and supply system, CW & ACW systems, Chemical treatment & DM water plants etc. 220kv switch yards are generally connected in two main and one transfer bus scheme. 220kv voltage level is either used at national grid level or at power evacuation switch yard of mega power plants or at main power receiving point of large industries. Entire control and protection of individual bay equipment is either carried out from field kiosk mounted bay control units or directly from control panels mounted in control building. These bay control units stay connected with substation automation system (sas/scada) in control room. 220kv switchyards are generally connected in two main and one transfer bus scheme. 220kv voltage level is either used at national grid level or at power evacuation switchyard of large power plants or at main power receiving point of large industries. Entire control and protection of individual bay equipment is either carried out from field kiosk mounted bay control units or directly from control panels mounted in control building. These bay control units stay connected with substation automation system (sas/scada) in control room.